Wednesday, Explore the World’s Most Famous Bicycle Race with Chuck, Gary, Lance Armstrong, John Eric Goff, and Neil deGrasse Tyson. Every year the world’s best cyclists descend upon the country of France to take part in the world’s most prestigious cycling race – Le Tour de France. History, drama, controversy, 21 days of excruciating racing, roughly 2,500 miles, and some fantastic physics at work. What more could you want? For this week’s episode of Playing with Science, we re-visit The Physics of the Tour de France featuring hosts Chuck Nice, Gary O’Reilly, legendary (and controversial) cyclist Lance Armstrong, and sports physicist John Eric Goff. Not to mention that we get a visit from our resident astrophysicist Neil deGrasse Tyson. 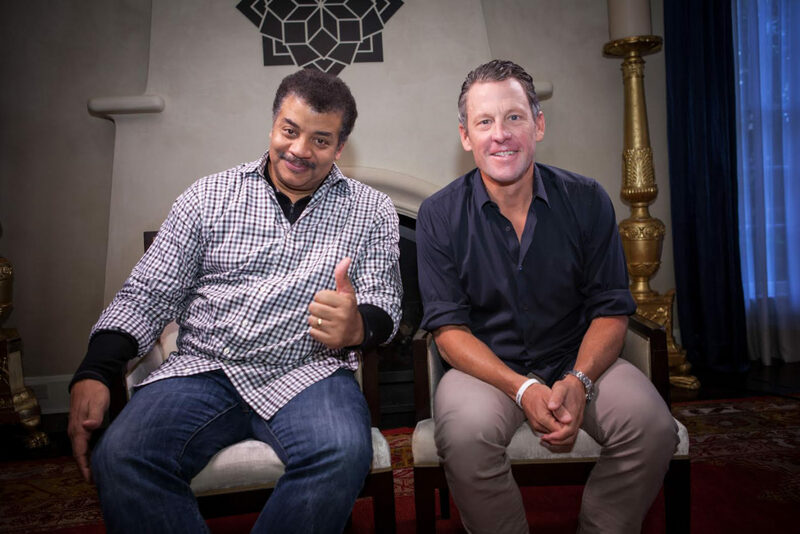 Neil deGrasse Tyson and Lance Armstrong, by Brandon Royal. You’ll hear about aerodynamics, Newton’s Laws, air resistance, drag reduction, skin friction, and turbulence. We also explore how drafting reduces energy output. Then, we dive into team strategy: nutrition, power-to-weight ratios, and how fan participation can be dangerous. Although this isn’t a new episode, we have brand new content from Chuck Nice and John Eric Goff on this year’s Tour de France which you can listen to now right here as a FREE All-Access Exclusive Original. Chuck and The Good Professor talk about the different stages of the Tour, they discuss John’s computer modeling and how he can give extremely accurate predictions for the race, until the point in the race where certain factors find their way into the mix. They also discuss what happens when athletes have to use the bathroom during the race – the answer is simpler than you might think. Please join us tomorrow night for The Physics of the Tour de France (Repeat) right here on our website, as well as on our Playing with Science channels on Apple Podcasts, Google Play Music, SoundCloud, Stitcher, and TuneIn. If you’re an All-Access subscriber, you can watch or listen to this episode ad-free. Tuesday, Get the Facts on Climate Change from Seth Shostak, Eugene Mirman, and Ken Caldeira. StarTalk Patron Creates New Telescope 101 Video Series; Has a Telescope Giveaway to Celebrate!